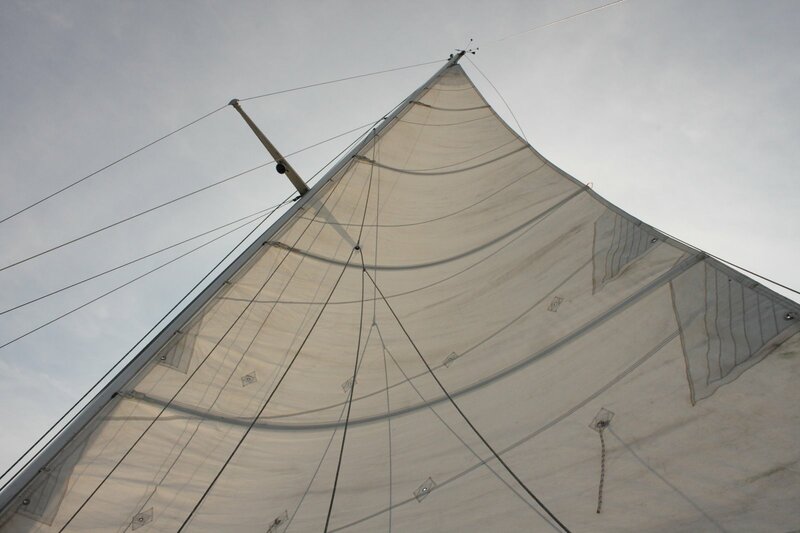 Isabella is a cutter rig built in 1979 in Santa Ana, California. 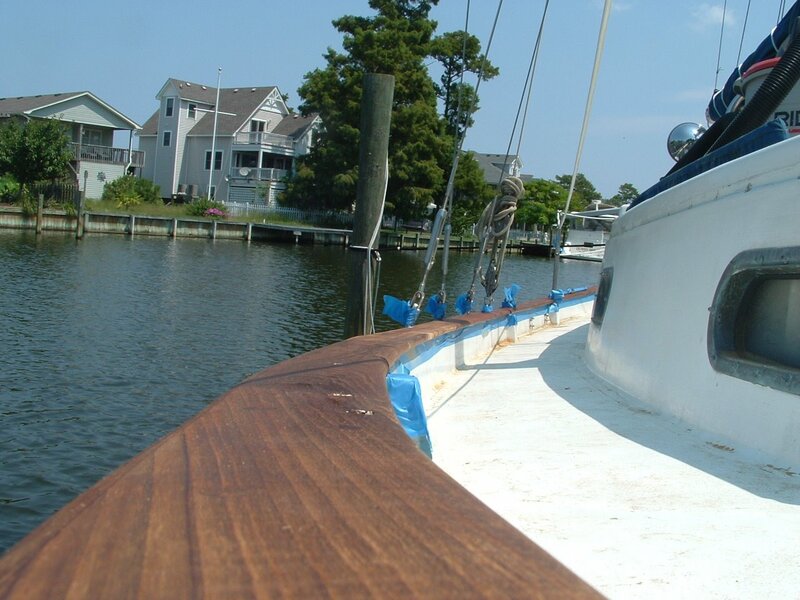 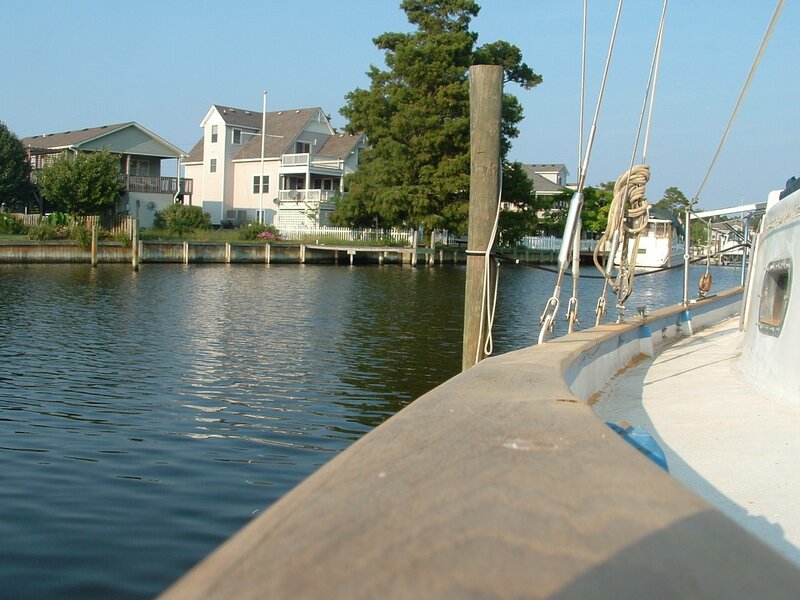 She has classic lines and a beautiful bowsprit. 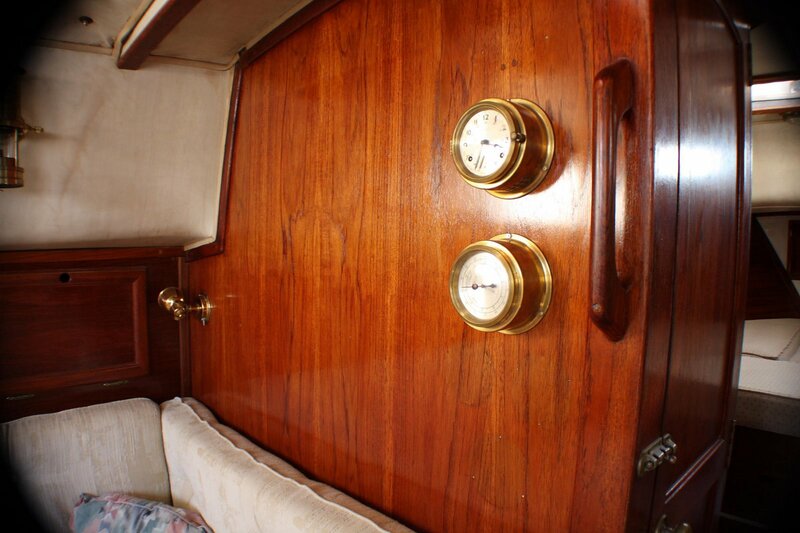 She was a sailboat show model boat, so has many non-standard upgrades including a stunning all-teak garage over the companionway hatch (recently refinished), a charming teak butterfly hatch (refinished in 2004), and a teak boarding ladder that has seen only light use and oval bronze ports. 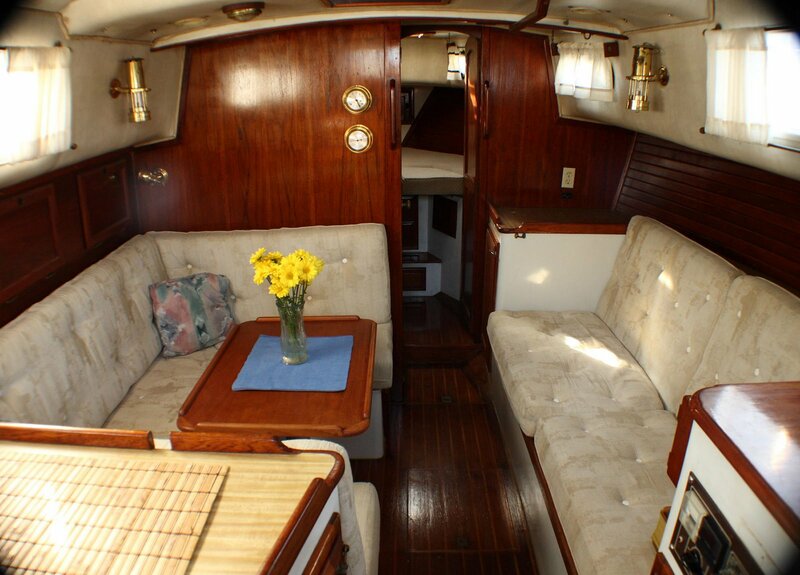 The spacious interior is all Burmese teak, which combined with a step-down salon with 6’7″ headroom makes it feel warm, cozy and roomy all at the same time. Four large non-opening ports in the main salon give excellent natural light. 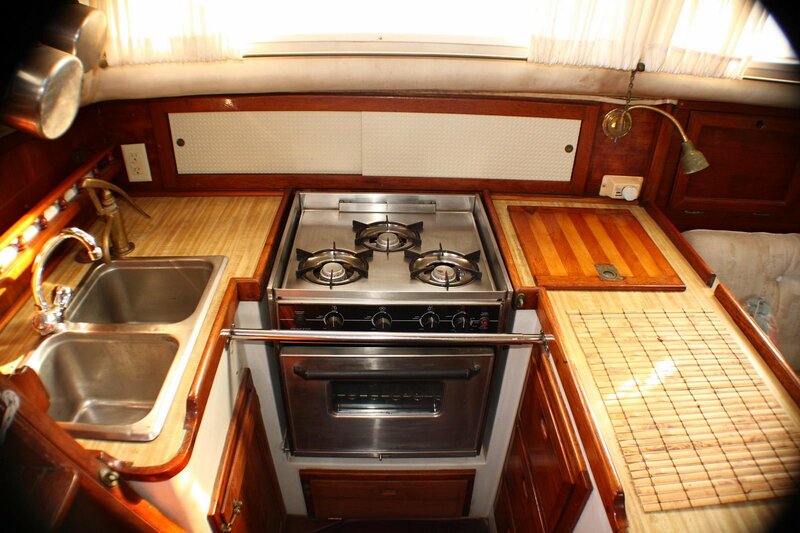 The u-shaped galley has a large, double stainless steel sink; 3-burner gimbaled propane stove and oven in excellent condition (Princess); 9-cubic foot draining refrigerator (Adler Barber 12-volt system) with 4 inches of polyfoam insulation; Formica counter tops. 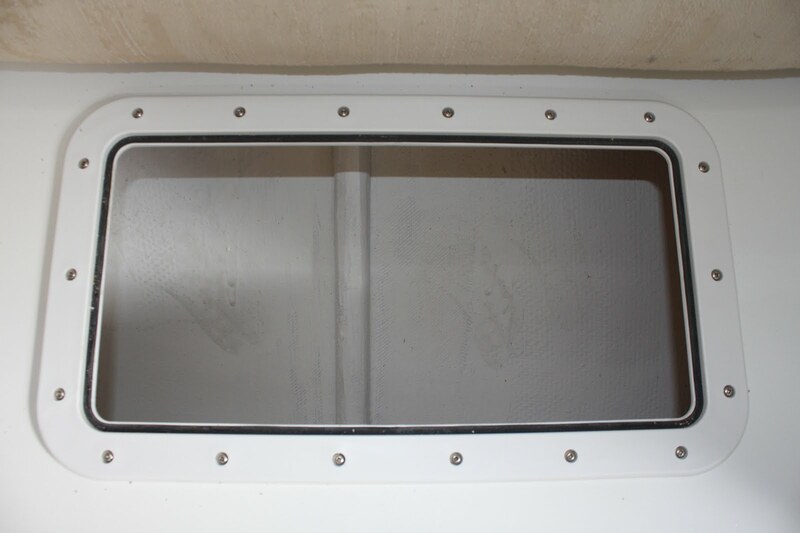 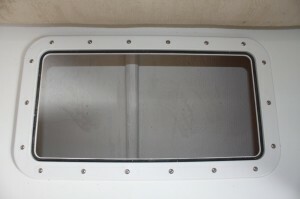 A navigation area opposite the galley with a full-size chart table that includes storage underneath, separate AC/DC control panels and electronics console. 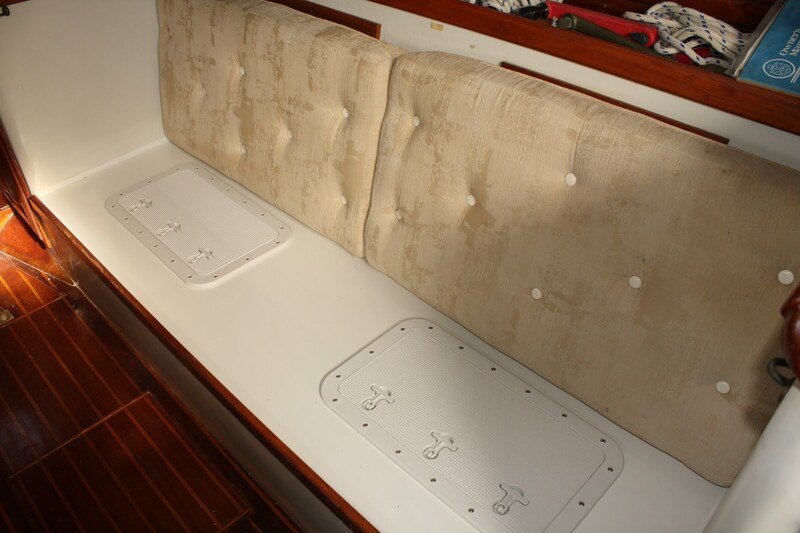 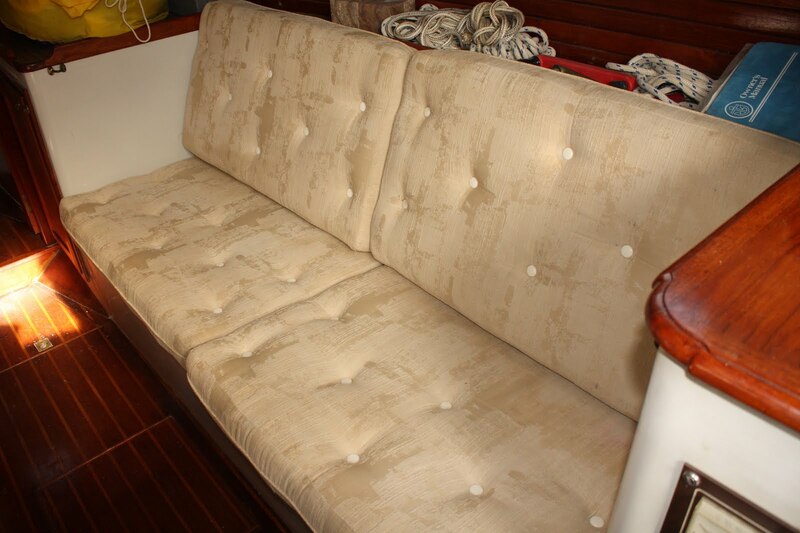 The chart table settee converts to a navigator’s quarter berth. 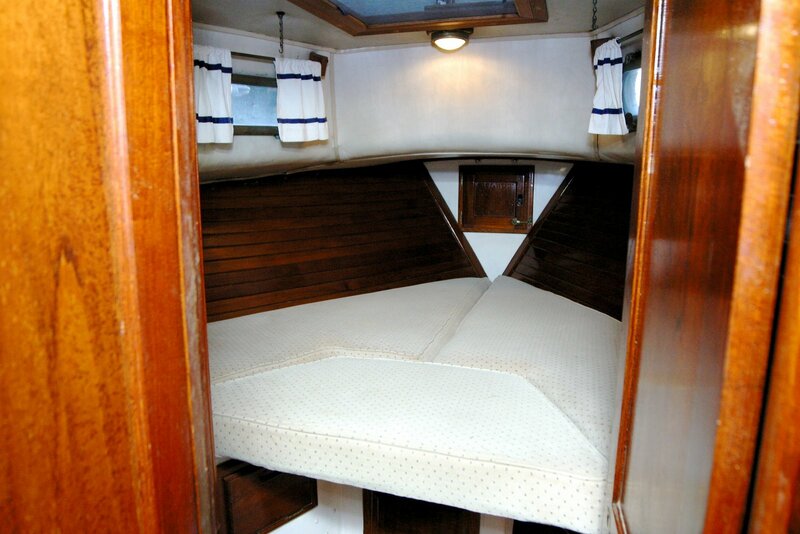 The forward v-berth is large with ample space to sleep two (88″ wide at the top, 80″ long at the middle), a roomy hanging cedar-lined closet and drawers, all in luxurious Burmese teak. The salon has two settees that convert to a double and a single berth plus a quarter berth under the cockpit on the starboard side. The head is accessible from the main salon. 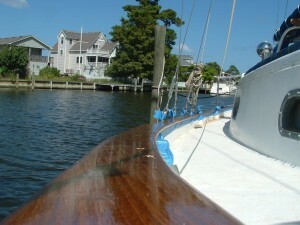 She displaces 17K pounds and rides nicely in rough or choppy water. 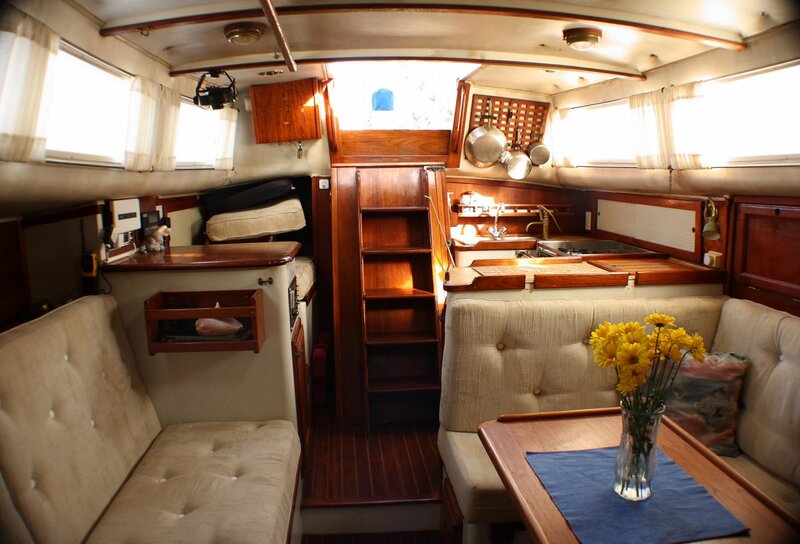 Isabella has been a full-time cruising boat sailing around the Caribbean and through the Panama Canal and an active daysailer on the Outer Banks. The cutter rig is easily handled by two crew or an experienced single-hander, thanks in part to the size of the sails and location of the winches. Boat was in fresh water for seven years and has been in brackish water for six years. 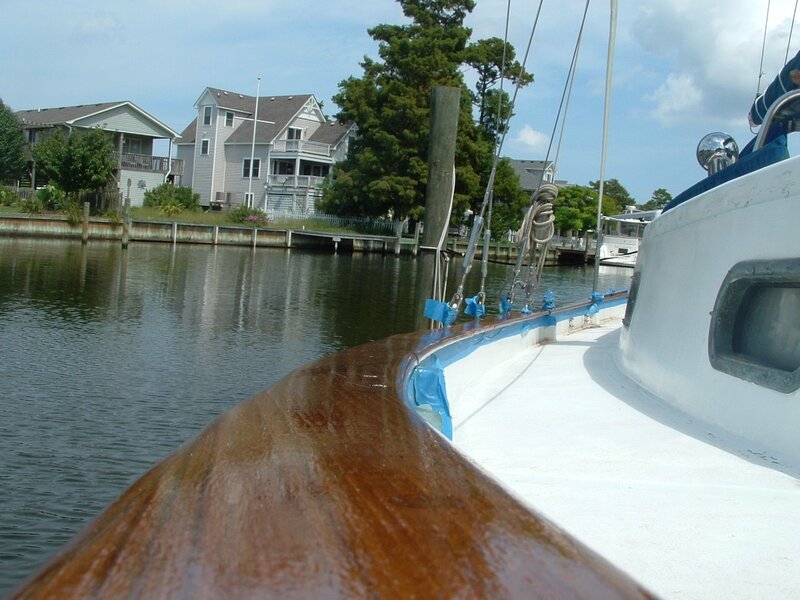 No blisters. isabella’s interior is spacious and cozy at the same time. 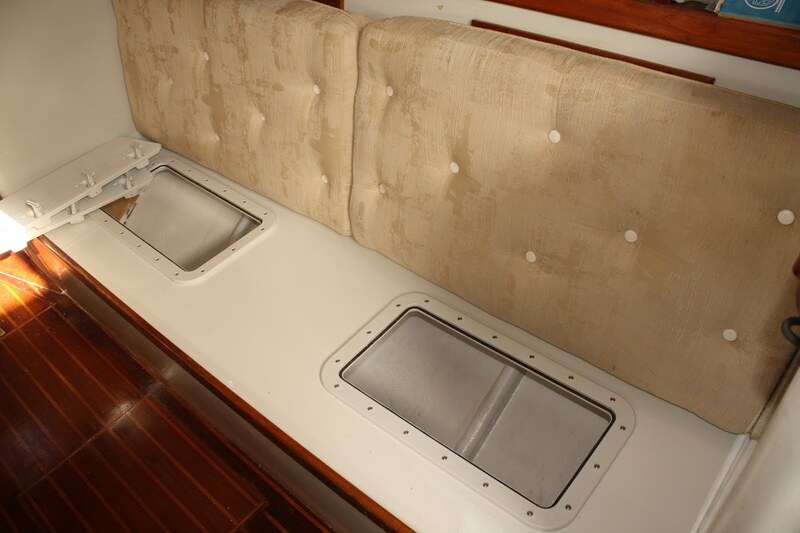 we refinished the bulkhead, and it looks fabulous! 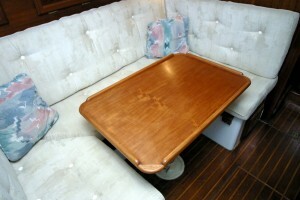 the teak table has been refinished with teak oil, sanded up to 1000 grit.